she may also love a new end table to put her cup of tea on. she may realize that her old rug is a bit small for the room. she imagines how beautiful the hardwood floors would be if they were refinished. she would need a new fancy steam mop to keep the floors beautiful and shining. after she was done cleaning the floors she would happily put her dirty rags into her new front loading washing machine. she's definitely going to want a set of new matching towels so every shower would feel like a trip to a fancy spa and hotel. she would love one of those tempurpedic mattresses to lay her head on every night. Craving Space In Our Space! Operation Purge! Isn't that a coincidence, I was just thinking the same thing. I don't believe much in coincidence because all too often it's brushed off as a moment of chance. Whereas I firmly believe, there are no coincidences. Our thoughts and ideas attract unto other's and by ways in which we can't quite explain, just by merely opening our eyes to the possibility we recognize less happenstance and more meant to be. 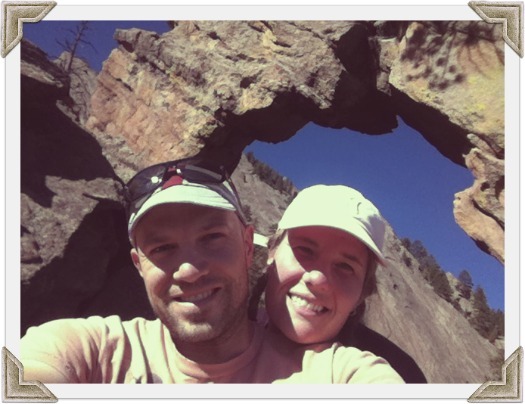 Four Years Later: Grateful To Be Way Better Off! Both presidential candidates are frequently throwing out the question to their captive audiences on the campaign trail, asking if we are better off now than we were four years ago? I think it's hard to listen to canned phrases from politicians on the topic, knowing good and well that they are wealthy and aren't really living the typical middle America lifestyle (yes, the President included). Even though I constantly hear about the doom and gloom of our society and economy, I feel so grateful to be able to reflect upon how much better our lives are now than they were just four years ago. Let's Hear It For, Date Morning! Sometimes life gives us a little nudge to seize the moment and when I do, I feel like patting myself on the back. Just a couple of weeks ago, Josh and I recognized that we could have a few hours to ourselves after dropping the girls off at school. While we have great intentions to have a babysitter for a regular date night, we also recognize how much a date night hurts our wallet. The night out is great, but dropping $50-$75 after getting home is the real stinger. Nowadays we tend to reserve babysitters for events, not so much for a casual night out. Double ouch. Shall we agree, staying creative is the key to a happy relationship? Last night we were able to attend a speech by President Obama at CU. I've been fortunate enough to see him speak twice, but felt even luckier to be able to attend as family. It's truly an emotionally charged feeling to observe your children as they watch the President of the United States engage a crowd of 10,000 people. Memories of a lifetime, right there. Autumn nesting, turning back into oneself. Reexamining. Staying present in the home, in the heart. Returning to the kitchen, something is always baking, soul nourishing soups and stews. Time to recharge. Maybe even, it's time to blog again. I dug up a post from 2009, the last time I attempted NaBloPoMo, National Blog Posting Month, and realized I had a very successful 24 posts. I'm impressed with myself, 24 posts in a month, I'm not quite sure if I've written 24 posts in 2012. Alright maybe that's an exaggeration, but truly not much of a stretch. It's time to fight the resistance and embrace this space that I've given so much to. Long story short, I'm back to try my hand at blogging. I have so much to say, it's time I honor that. You can find the NaBloPoMo Blogroll hosted over at Blogher now. 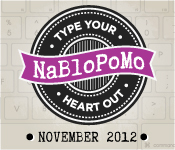 I guess NaBloPoMo has grown up since I last participated.